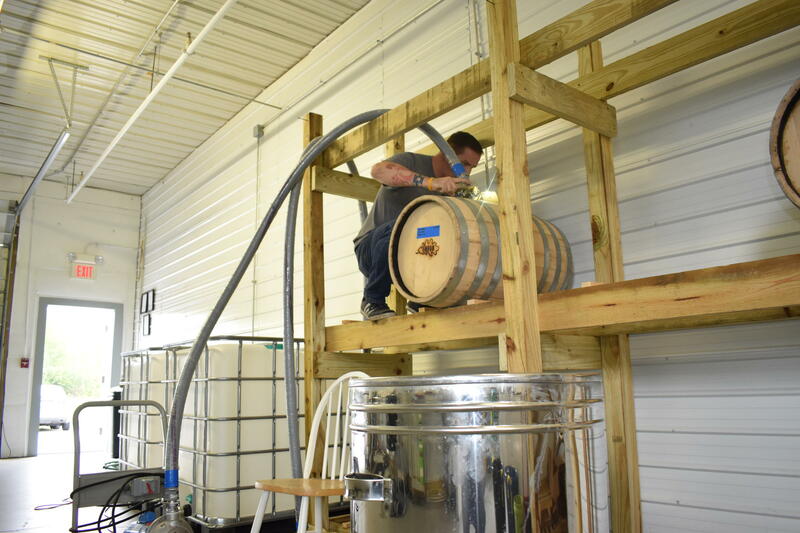 Steve Gagner fills one of the first barrels of bourbon from Danger Close Craft Distilling. 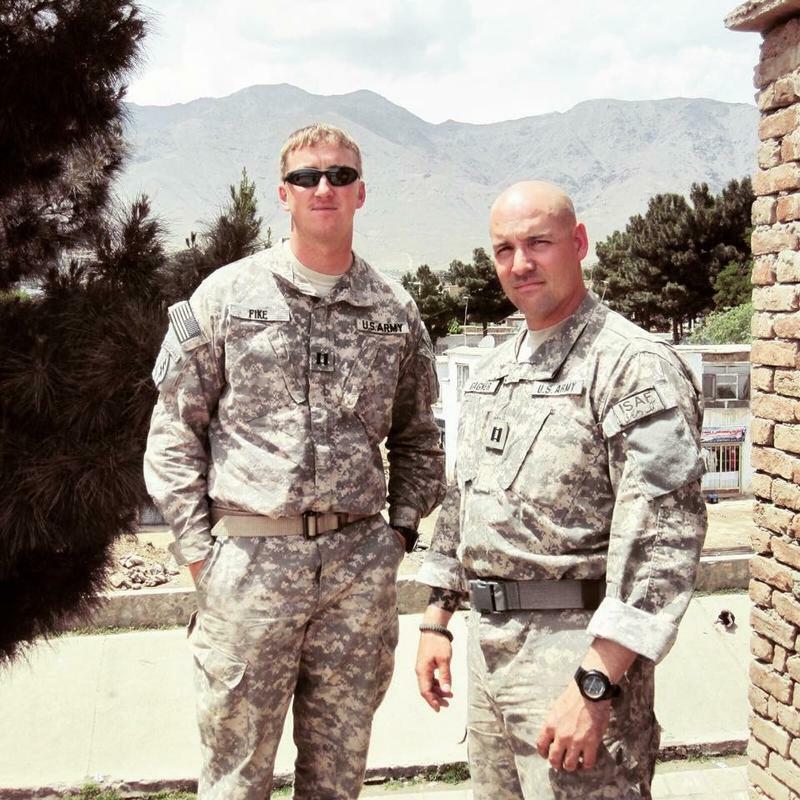 Zac Fike (L) and Steve Gagner (R) served together in Afghanistan. A few years later, they're starting their own distillery: Danger Close Craft Distilling. Having served together in Afghanistan, Zac Fike (L), Matt Kehaya (middle) and Steve Gagner (R) are using this industrial garage to barrel their first batches of bourbon from their new venture: Danger Close Craft Distilling. Over the past 15 years, the number of licensed distilleries in the Green Mountain State has increased nearly ten-fold: from just three to more than two-dozen. But a new distillery in northern Vermont isn’t just manufacturing spirits. It’s raising the spirits of the community, especially when it comes to veterans. In an industrial garage in Saint Albans, Steve Gagner uses an electric pump to transfer clear, strong-smelling liquid from a tank to a white-oak barrel. “Alright, so we’re opening the valve from the spirit tank to the pump, positioning the nozzle over the barrel, and now we fill for 33 gallons,” he said. Open this barrel in a year or two, and you’ll taste one of the first batches of bourbon from Danger Close Craft Distilling. Gagner knows the meaning of “danger close” first-hand. He's a major in the Vermont Army National Guard, and served in Iraq and Afghanistan. After returning, he and fellow Army buddy Matt Kehaya started 14th Star Brewing Company in downtown St. Albans. Zac Fike (L) and Matt Kehaya (R) work on a batch of beer at 14th Star Brewing Company. 14th Star donates proceeds from every batch to local nonprofits. Gagner said a distillery was a logical next step, since the base ingredient for bourbon and whiskey is unfermented beer. “We already have a facility where we can brew world-class beer, and so we didn’t have to replicate that to create this place,” Gagner said. So they brew the unfermented beer -- or "wurt" -- downtown, at Fourteenth Star. "We truck it down here and it goes into our fermenters," he said. "And then we can distill the alcohol off from that." They produce 6,000 gallons of beer a week at the brewery. They donate proceeds from each batch to local nonprofits, from food kitchens and preschools to veterans’ organizations like the Josh Pallotta Fund, which seeks to raise awareness of traumatic brain injury and post-traumatic-stress disorder, and reduce veteran suicide. "Josh deployed with us to Afghanistan in our brigade," Gagner explained. "When we came home, he succumbed to TBI and PTSD and took his own life." Now that Danger Close is up and running, the team will support their fellow veterans in a whole new way. Zac Fike is Gagner and Kehaya’s newest partner; the three served together in Afghanistan before Fike was wounded by an insurgent rocket attack. As the Purple Heart recipient explains, the Danger Close team will use its experience to teach other veterans about launching and running companies of their own. “Part of our business model, going into the future, is to be able to share that with other veterans -- having them come to our facility whether it’s at the brewery, or here at the distillery, learn a trade, give them the confidence to be brave enough to actually take that leap when it comes to starting their own business,” Fike said. Because the way Steve Gagner sees it, veterans are especially suited to be leaders in any industry. They’re experts at building and working in teams, they have an iron stomach when it comes to taking risks, and they know how to plan an operation. Steve Gagner, Zac Fike, and Matt Kehaya aren’t just distilling bourbon; they’re also working on a rum, made with Vermont maple syrup. But, as Gagner and Kehaya point out, with retirement from the military still a few years off all plans are subject to change. “We’re also all deployable, so that kind of plays a factor,” says Kehaya.